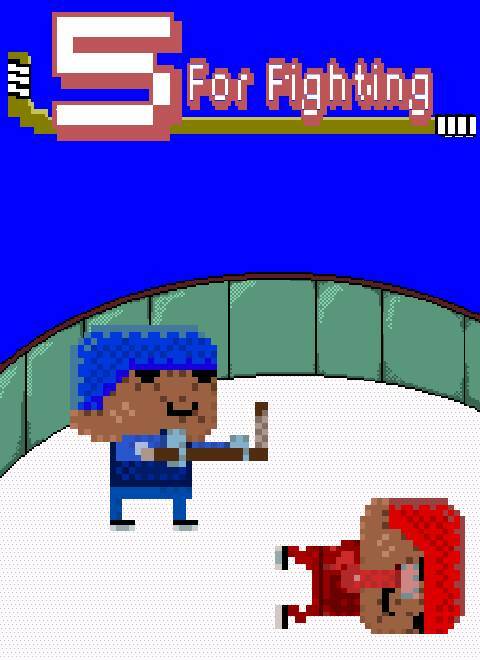 5 For Fighting is a NES style hockey game like Blades Of Steel or Ice Hockey, but with a fighting twist. Shoot, pass, check and block will seem familiar to fans of hockey games. But the bazookas, reflector shields, land mines, and other power ups will be a brand new blood spewing delight. 4 player local support, frag your friends face to face! An arsenal of weapons and gear to make your hockey game fun and unique every time. Classic Mode will allow you to settle who's the best without any weapons... like you'd want that. "Blow-you-out-your-socks" pixel art and animation! More gore than you can shake a stick at! Stay tuned for updates as 5 For Fighting progresses. If you have any comments or ideas, please leave them and I'll tell you how stupid you truly are. Thanks and frag on! BOTS added so there's always someone to play with! Respawn / Line Change now works. Makes for endless fragging fun! Turn up the hurt with Telefrag Entertainment's latest in trash talking technology.